Summer is coming to an end, the days are getting shorter and soon the air will be cooler. Autumn is right around the corner, and Boulder is full of great events to celebrate the changing season this September. Below is a comprehensive list of festivals, art events, fairs, fitness opportunities, kids activities and so much more! All happening in and around Boulder this September. Learn about your soul essence, past lives, and the colors of your aura at the Psychic Fair hosted by the Boulder Psychic Institute. Ask questions and get answers about career, money, love, family, relationships, spirit guides, angels, and life purpose. Receive a 15-minute reading at the Boulder Farmer’s Market for $15. No need to schedule, just show up! Cost: $25 gets you unlimited sample tastes of the beer and a Souvenir Glass, $30 at the door. Designated Drivers are fre. Tickets available here. Louisville’s Original Brewfest, Pints in the Park will be held at Community Park in Louisville! The brewfest will feature many local breweries giving out sample tastes of their delicious beer. Food will also be available for purchase from a handful of local restaurants. Tickets are limited and the price goes up the day of the event so make sure to get yours today! This is strictly a 21 & Over Event, no infants or children. Dogs are not allowed, please keep them at home. Where: Various locations, schedule here. Time: See full schedule of events here. 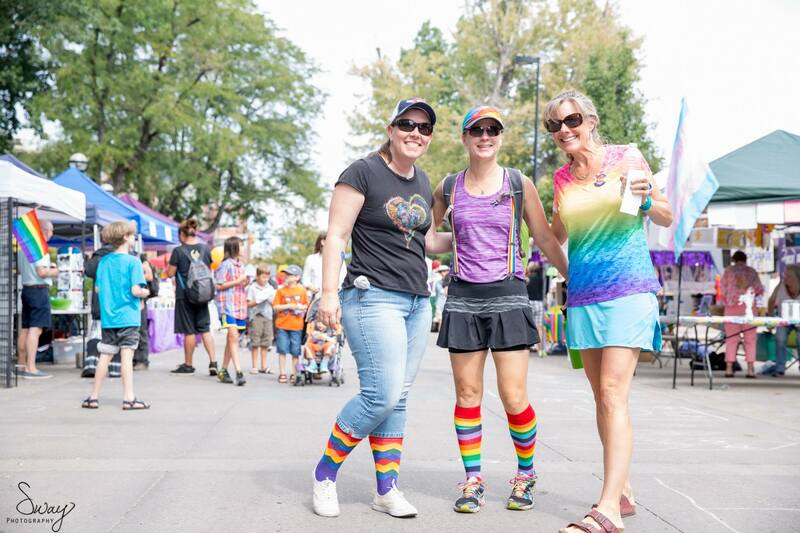 Pridefest is Boulder County’s largest LGBTQ event of the year, featuring vendor booths, music, a youth and family area, a health and wellness area, musical guests, food trucks, entertainment and more. Come early and stay late! Meet new friends and connect with ones you haven’t seen all year. Delicious food trucks include I Scream Colorado L.L.C., Em’s Ice Cream, Tayziac J’s, The Ginger Pig, Suburban Wiener and Cuban Fusion! The Big Gay 5K will be held on Sunday, September 10. Register for the race here. Cost: $35/pet. Tickets available here. AGoldPhoto will be taking pictures to raise funds for Boulder Valley Humane Society! The photo shoot sitting fee for each pet is $35 and 100% of the sitting fee goes to the shelter. You’ll receive an online gallery with photos from the shoot to choose from. Each edited digital photo is $20, with a minimum order of 3 digital photos. Multiple Pets? Each dog does require its own time slot. If you would like photos with multiple dogs, photos can be taken together and if they don’t cooperate, can be taken separately and edited together. Cost: Chili Fest entrance is FREE, chili tasting cups are $5. The Beer Fest is $35, $40 at the door, VIP tickets $60. Tickets available here. The 2017 Chili Fest is back for its 17th year, this year’s Chili Fest features great chili samples and food, local vendors, a FREE Kids Zone area (Zip Line, Quad Trampoline, Jumpy Castles) and more! Please note that chili samples are generously provided by the cooks and are distributed first come-first served. Get there early as the samples always go fast. Chili tasting cups will be available for purchase – BACK AGAIN THIS YEAR for $5 you may purchase a reusable chili tasting cup with attached spoon – eat all the chili you want and take home the commemorative cup! The event will also feature a “People’s Choice” competition between eight of the best local restaurants! Music at the Chili fest will feature Rouge 2 and local favorite Over Soul’d. The Boulder Valley Rotary Club is partnering with Chili Fest to bring you the 4th annual Boulder Valley Beer Fest. The beer fest features unlimited beer samplings from over 20 local breweries and souvenir mug. VIP tickets include catered food, limited edition specialty beers, wine tastings, desserts, margaritas, all located in a prime location near the live music. You will also be given early access to the event at 1:30pm. All net proceeds from this fundraiser will be used by the Rotary club to support its many active community projects from improving literacy locally to helping eradicate polio globally. To purchase beer fest tickets, click here. Explore craft/micro beers one pour at a time! The Lafayette Brew Fest features 25 Breweries/Cideries all within 75 miles of Lafayette. Local Food includes – UTurn BBQ, Sammy’s Fried Cheese, Suburban Weiner, Butcher and the Blonde and Low County. Enjoy music by Iron Spoke Reunion. 21 & Over to drink (Must show ID at the door) There are no age limits for entrance, but there are limited things for those under 21 to do at this event. Use your discretion in bringing kids. Be kind to your pets and leave them at home. Only service dogs allowed in the barricaded area. Join this outdoor Yin Yoga class at Luvin Arms Animal Sanctuary. Complement and balance your high energy (Yang) activities with a gentle class that relaxes and restores! This series of floor postures targets the connective tissues, leaving you with a feeling of lightness and ease in body and mind! PLEASE BRING A LARGE TOWEL to use as a prop. This 60 minute class is suitable for all levels and is followed by a tour of the sanctuary. At this special event at the Agricultural Heritage Center, attendees will learn about old fashioned jobs and the traditional arts and crafts that went into making what was needed for life down on the farm. Sweaters, candles, even door hinges were made by hand, using skills not widely practiced today. Crafts and Trades of Olden Days offers several games and demonstrations including blacksmithing, candle-dipping and working with a drop spindle. Other activities include soap making, Victorian hair art and storytelling. Several “make and take” activities are offered as well. This free event is fun for all ages. Please note that no pets are allowed on the farm. A festival of literature from all over the world, ZEE Jaipur Literature Festival at Boulder promises to be an event unlike any other. Free and accessible to everyone, rich with words and ideas, the Festival examines the human experience through the reflections and imaginations of distinguished contemporary authors from across the globe. Featuring internationally acclaimed authors and innovative minds including: Suki Kim, Micheal Rezendes, Akhil Sharma, Alberto Ruy Sanchez, Anne Waldman, Christina Lamb, Dan-el Padilla Peralta, Erling Kagge, Larry Pressler, Namita Gokhale, Navtej Sarna, Shashi Tharoor, Vikas Swarup, William Dalrymple and more. Cost: Dance party tickets available $10 in advance and $15 at the door, tickets available here, food and drinks available for purchase. Shine Restaurant & Gathering Place is moving to a new location, with a new focus and is celebrating the big transition with a dance party! Enjoy favorite items from Shine’s menu as well as Shine Potions and libations all night long. DJ James F Barry will begin the dance party at 8pm we celebrate all things Shine: the past the present and future. Shine will reopen this fall as Shine Restaurant and Potion Bar at the new location: 2480 Canyon Blvd. Avery Brewing Company is hosting a free yoga class on its front lawn to celebrate its partnership with Bhakti and the release of Avery’s limited Chai High brown ale. Enjoy a complimentary Bhakti Chai before class, a 1-hr outside yoga class led by Core Power Yoga, and a complimentary Avery Chai High beer afterward! Feel free to stay for lunch afterward! An Indian-inspired menu will available. Space is limited, please RSVP to attend: http://bit.ly/chaihighyoga. Please bring your own yoga mat. Mats will not be provided. Must be 21+, please bring your ID! The Butterfly Pavilion is offering admission for just $5 on Saturday, September 16. Home to over 5,000 animals, kids will be immersed in a tropical rainforest where 1,600 butterflies live and Rosie, the tarantula is ready to be held by brave children. Step to Water’s Edge to be immersed in an underwater world full of sea creatures. The pavilion also features lovely gardens and a nature trail, as well as a fun gift shop. Where: Various art studios around town, full tour map here. 36 art studios and venues, showcasing the work of 57 participating artists, will be open to the public during the free, self-guided 2017 Longmont Studio Tour on September 23-24 from 11am-5pm both days. Step into Longmont’s richly diverse visual arts community by meeting the artists where they work and show. Buy original art directly from the creator, where you can learn about the medium and story of the pieces. Free Tour Maps available at Arts Longmont Gallery, 356 Main St., Longmont. Autumn Gold Festival is Estes Park’s fall celebration – a Festival of Bands, Brats & Beer. Entrance is free to dance, listen to music and enjoy the festival. The Estes Valley Sunrise Rotary will be offering mustard-smothered bratwursts, cold brews, soft drinks and more as talented local musicians and award-winning Colorado bands play. Browse the vendor booths who will be offering corn on the cob, funnel cakes, fresh squeezed lemonade, roasted almonds and desserts. Free family activities include face painting, corn bag toss, a bounce house and a classic car show. The highlight of the Autumn Gold Festival is the popular raffle with the winner taking home the grand prize of $5,000. Additional prizes include a $2,500 runner-up prize and various other cash awards. Raffle tickets are $25 each. Cost: $8/person in advance, $10/person day of, Children under 2 and seniors are free. Tickets available here. Wild Bear Nature Center will be hosting its 17th annual Enchanted Forest! Join us as we connect with the magic of the Fall season and the greater community! Take a tour of the forest and meet the animals who will tell their stories and how we can help them! Expect a full goody bag of special treasures from the forest animals! Enjoy loads of activities in Downtown Nederland, including professional face painting, creating your own costumes, live musical and theatrical performances, forest tours, and fairy magic. Dance with the bears! Enjoy yummy foods, hot drinks, and a community driven bake sale. People of all ages welcome and costumes are encouraged! Seniors and children under 2 years are free. Please note: Tours last 1 hour, and the last tour will be leaving at 5 pm. There are still lots of activities going on in the forest for latecomers to enjoy. Monarch Day is a fun-filled celebration of these amazing butterflies at the Butterfly Pavilion. From their important role in our ecosystem to their incredible migration, there’s so much to discover! The Butterfly Pavilion is home to over 5,000 animals! Kids will be immersed in a tropical rainforest where 1,600 butterflies live and Rosie, the tarantula is ready to be held by brave children. Step to Water’s Edge to be immersed in an underwater world full of sea creatures. The pavilion also features lovely gardens and a nature trail, as well as a fun gift shop. Professor Janet deGrazia, CU Boulder Professor of Chemical and Biological Engineering, will delight young science enthusiasts by demonstrating some extraordinary (& perhaps unexpected) properties of fluids in the S.T.E.M. show Go With the Flow. Did you know that you can use water to start a fire? Or that hydrogen by itself won’t burn, but add enough air and BOOM!! What happens to a little ethanol in a bottle if we add a wee spark? How can two fluids when mixed together become a solid? How is smelly red cabbage juice especially useful? Find out the answers at the show! To celebrate the annual elk rut and learn about the “wapiti,” the Native American name for elk, Estes Park hosts the annual Elk Fest in Bond Park. The free festival features bugling contests, elk exhibits, the Rocky Mountain Raptor Program, elk seminars, elk-inspired arts and crafts, Native American music, dancing and storytelling, a childrens’ area with elk-themed activities, and a craft beer garden. For safe & respectful elk viewing tips, please visit Estes Park’s Wildlife Watching page. Vendors will display artwork, handmade elk-ivory jewelry, and will offer distinctive elk cuisine. Mountain men from around the country will gather at the Mountain Man Rendezvous to sell their wares and demonstrate their skills. Enjoy the Educational Seminar Tent to learn more about Elk and wildlife in Estes Park from a variety of professionals including Colorado Parks and Wildlife and Mile High Note Game Calls. Live country, rock and bluegrass music will light up the park Saturday and Sunday with popular Colorado bands performing on stage.